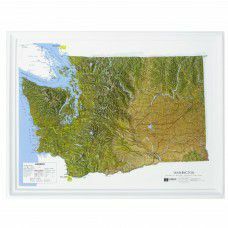 The Washington State natural color scheme raised relief map is produced at a scale of 1:1,250,000 or roughly 1" = 20 miles. Feel the Cascades, the Olympic Mountains and more! An interactive way to learn the geography of our state. What's the highest peak in Washington State? Mt. Rainier!